Our hire fleet includes a large selection of robust mud mixing and mud storage equipment. Many of our mixing and storage tanks are built to the same dimensions as type 20’ type 1CC freight containers and are Lloyd’s Register certified, thereby enabling them to be shipped as seafreight containers. Thoughtful design means that pumps, jet hoppers and other smaller equipment can be transported within the container sized units. Our range of venturi jet hoppers allows bentonite, other powders and liquid products to be effectively mixed with water at high volumes. Skid mounted venturi jet hoppers are available in 4” and 6” but pipework adapters can be supplied to suit a customer’s requirements. The units may be rented on their own or with purpose built mud mixing tanks which include vertical shaft agitators. 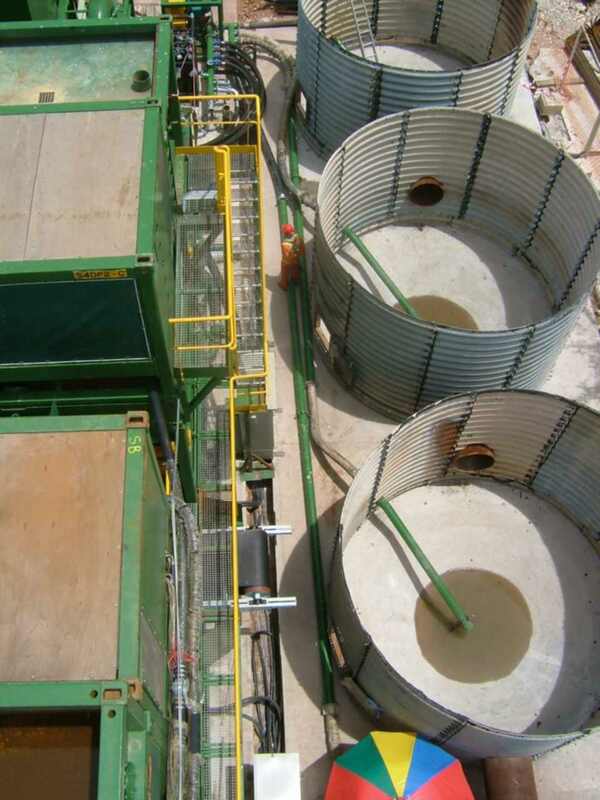 Specially designed tanks for the mixing of bentonite, with capacities of up to 30m3, are supplied with Venturi jet hoppers and are fitted with vertical shaft, electric powered agitators. Click here to view a pdf data sheet for a mixing tank with venturi jet hopper. Supraton and Polygator high shear mixers offer on-line mixing of bentonite with little requirement for the bentonite to yield as is normally required with venturi mixers. These units are often used in conjunction with PSD’s big bag handling equipment and details can be provided on request. Mixers for both solid and liquid grade polymers are available for rental. Solid grade mixers have variable speed polymer feeders and are designed to be operated on top of an agitated tank. Liquid grade mixing systems are supplied with an integral tank, vertical shaft agitator and variable speed dosing pump. A range of tanks of up to 30m3 capacity with twin or single vertical shaft agitators are available with valved connections to suit your requirements. The larger tanks are built to type 1CC container dimensions and are certified for shipment as seafreight containers. Straight sided or hopper type storage tanks of up to 35m3 capacity are available with low level valved connections. Circular storage tanks of larger capacities such as 125m3 and 200m3 are available to special order.